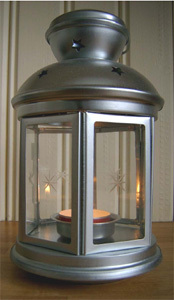 Beautiful lanterns with glass panels around the body and star shaped cut outs on the top, finished in a mat chrome effect. They can be placed in trees, along a walk way or used as table centre. Suitable for tea light candles only. 20cm tall excluding the handle and 12 cm wide. 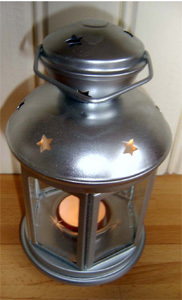 Price includes slow/long burning tea light candle.